Ion beam neutralization is a significant challenge in electric propulsion and is needed to reduce beam electric fields, manage space charge, and reduce ion sputter of the spacecraft. To address these challenges, simulation can be used to investigate ion/electron interactions, predict space charge distributions, and optimize system properties, such as cathode location, beamlet current, ion density, and electron temperature. However, beam neutralization can be a challenging problem to simulate due to the extreme difference in mass between ions and electrons as well as the complex interaction of electromagnetic forces. 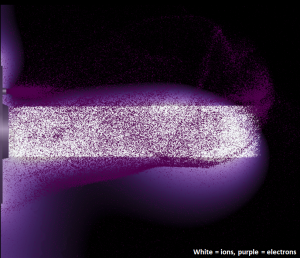 VizGrain is used to model the beam neutralization using a full, kinetic particle-in-cell (PIC) modeling approach. Both ions and electrons are modeled as kinetic particles. Typical simulation approaches in literature involve initializing both ion and electron beams from a single, pre-mixed source. This example simulates a configuration in which the electron beam source is located outside of the ion beam. This allows us to investigate the initial mixing and entrainment of the electrons. The 2D simulation geometry is shown in the Figure 1. The spacecraft, shown in green, is set to a reference of 0 V. The electron beam, shown in blue, is injected with a temperature of 2 eV. The ion beam, shown in red, has a beamlet current of 5mA. To adequately resolve the electrostatic potential required to model ion and electron interaction, the Debye length must be resolved in the mesh. The resulting mesh is ~400K cells using a structured/unstructured mixed meshing approach. Animations of the results are shown in Figures 2 and 3. Figure 2 shows the electrostatic potential with the interaction of ions (red) and electrons (blue). Figure 3 colors the particles by velocity. 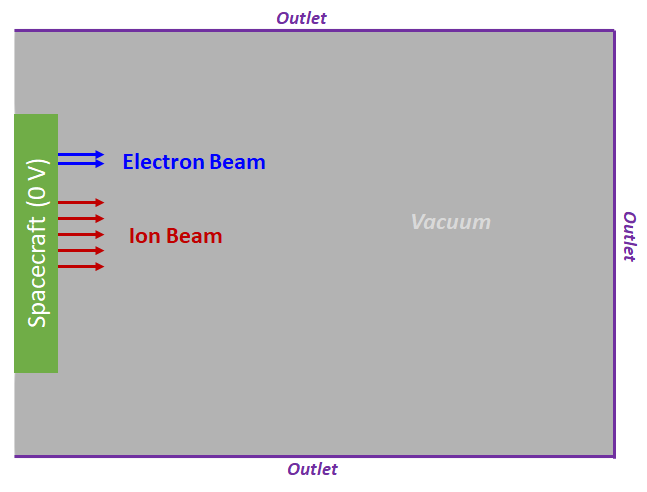 The electrostatic potential of the ion beam attracts and entrains the electrons. As shown in the velocity plot, the electrons are accelerated as they enter the electrostatic potential well created by the ion beam, then slow down as they exit the beam. Additionally, an instability can be observed in the electron beam in which the electrons begin to oscillate around the ion beam. The magnitude of the oscillations will likely decrease as the neutralization approaches steady state. Finally, Figure 4 compares the electrostatic potential with and without electron neutralization. As expected the electron beam greatly reduces the potential, effectively neutralizing the beam. Note that the minimal ion beam divergence for the case without neutralization is attributed to the low beamlet current. This example demonstrates VizGrain’s PIC modeling capability for electric propulsion applications. VizGrain is the 1D/2D/3D kinetic particle module within the OverViz Simulation Suite that provides scalable parallel simulation for large, complex problems. OverViz is an industrial multiphysics framework for performing hybrid plasma, fluid flow, electromagnetic, particle simulations. For more information, please contact us at info@esgeetech.com.